Although a small town, Bergen has several international festivals that you should not miss. As a movie lover, you also need to be proud that Bergen has a world-class film festival. Bergen International Film Festival serve no less than 120 films from around the world and make this event as one of the best film festivals in Norway. Bergen International Film Festival recently held since 2000 is still fairly young for an annual international event, but an event every October is pretty consistently present a variety of films with different genre for the movie lovers in Norway. Festival which has been held since 1953 start every late May to early June for two weeks. Previous Bergen International Festival is the only festival of music, but now it has evolved and not just focus on the art of music. Variety and performing arts, such as theater, dance, ballet, opera, literature, visual art also to enliven the festival. Festival usually deployed in multiple locations around the centrum Bergen and rich in historical value, such as in Hakon’s Hall, Grieg Hall, or the Bergen National Theatre. Bergen International Festival is ready to entertain the audience of art involving artists from Norwegia or international artists as performers. Classic music lover certainly no stranger to the name of Edvard Grieg, Norwegian composer famous music. 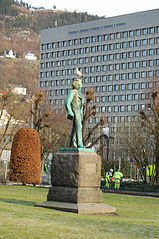 Bergen has a special relationship with the composer Grieg as well born and lived in Bergen. In addition to making the house that once occupied Grieg as one of the city’s museums, Bergen is also an annual music festival held in Bergen Grieg specifically dedicated to Grieg. The festival is held each summer between June and September. Bergen is synonymous with rain, almost every day with heavy rain can fall. To celebrate the condition that it is held Rain Festival each October to celebrate the wettest day in Bergen. Every year, residents and tourists mingle celebrate bad weather, they would gather in the main street with umbrella and wearing a raincoat, and then perform in the parade along the road Bergen.